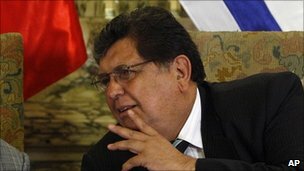 Peru says it has suspended diplomatic relations with Libya over the use of force against civilians there. It is the first country to take such a step since the anti-government protests erupted in Libya last week. Peruvian Foreign Minister Jose Antonio Garcia Belaunde said he hoped other Latin American countries would follow suit. Peru said the move was aimed at highlighting “the grave situation in Libya”. Mr Garcia said he would ask the United Nations Security Council to impose a no-fly zone over Libya, to prevent the use of fighter jets against the civilian population by the Libyan government. Meanwhile, Libya’s traditional allies in the region, Cuba and Venezuela, have urged what they called imperialist states to stop interfering in Libya. The former Cuban leader Fidel Castro accused the United States of being ready to order an invasion of Libya. On Monday, Venezuelan Foreign Minister Nicolas Maduro said he hoped the Libyan people would find “a way of solving their problems peacefully without the interference of imperialist states whose interests in the region had been affected”.